While it all began quietly and humbly In the form of a few reports and booklets that emerged out of our field work and interaction with children and teachers, it was quickly realized that publishing quality material could be a vital supplement and valuable addition on the way to the goals that we were out to pursue. We thought it to be an efficient medium to increase the reach of our philosophy and ideas way beyond the restrictions that our limited resources and activist power imposed on us. 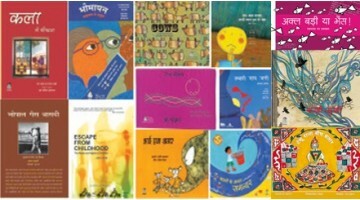 Bit by bit the caravan of books grew to include educational classics, educational modules for teachers and children, picture books, material for young readers and beginners, activity books, fiction and non-fiction, books on various social issues and so on. अपने आसपास की दुनिया को किसी मकसद से ध्यानपूर्वक देखना एक रोचक अनुभव होता है। इस किताब में बच्चे पत्..